Top of the morning to you as we view the top 10 things to do in March 2019. Although we lose an hour of sleep, everyone has had just about enough of a Lake County winter wonderland. Can you believe the first day of spring is this month?. Spring brings things like warmer weather, melted snow and a slew of Lake County activities to experience. Why would you leave Lake County for Spring Break when you have all that you need right under your nose? Don’t forget to savor the flavor during the most delicious week of the year: Lake County Restaurant Week. Over 65 restaurants are participating, so give your belly a treat or two (or 10 days so it can experience an abundance of palettes). Without further adieu, here are your top 10 things to do in March. “A person’s a person no matter how small.” That old Doc named Seuss still has tricks up his sleeve as the whos from Whoville try to be heard by the outside world. And who’s the only one whose lent them their ear? Horton, that’s who! View your favorite storybook characters from the world of Seuss live on stage as the one-hour presentation features our favorite elephant as mentioned earlier, the Cat in the Hat, Gertrude McFuzz, Lazy Mayzie and a slew of other fun-loving fuzzy creatures. The original Broadway production saw Kevin Chamberlin (who played Horton) receive a Tony Award nomination. “Seussical the Musical” will conduct a Q&A for the kiddies following the show. Now-March 31. Various times. Tickets: $15.23. Marriott Theatre, 10 Marriott Dr., Lincolnshire. Lake County Restaurant Week: 10 Days to Savor returns as the delectable event runs through Sunday, March 10. 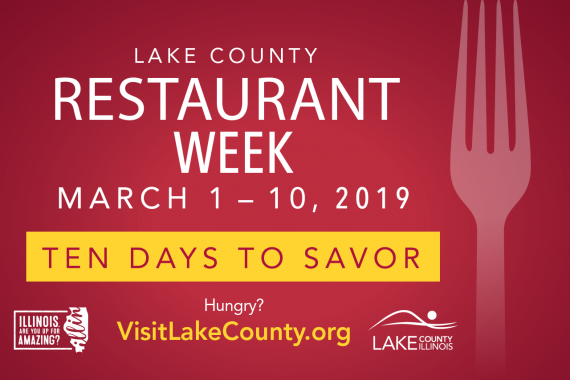 There are over 65 participating Lake County Restaurants featuring prix fixe menus or specials offers at the event sponsored by Visit Lake County and 102.3 XLC. This event urges attendees to discover, dine and share. Foodies will find new favorites, sample local cuisine and share their experiences on social media with #LakeCountyRW. Through March 10. Various locations across Lake County. It is unmatched witnessing a live show. From reciting your favorite tune while singing with an exceptional songster, to the atmosphere of everyone rocking their socks off to a legendary performance. Here are some of the concerts featured in Lake County in March. Who doesn’t like waffles, pancakes or French toast doused in syrup? All throughout March, treat yourself to the sweet sap and sugar maples on a one-hour hike at Ryerson. In this hike, you will learn everything there is to know about how the maple trees supply that sticky substance that you cover your breakfast with. Each walk begins every half-hour between noon and 2 p.m. The family won’t be sappy about attending, but maple they ’ll be enticed; especially just days before and after National Pancake Day (on March 12). March 9-10, 16-17, 23-24. Admission: $6. Kids ages three and under receive free admission. Ryerson Woods, 21950 N. Riverwoods Rd., Riverwoods. As the Marvel live cinematic world continues to thrive in the box office worldwide, the Bess Bower Dunn Museum in Libertyville will display the Marvelocity: The Art of Alex Ross exhibit. Ross, a 30-year veteran in the comic book industry, has portrayed revitalized illustrations through his lens to give these characters a more modern appearance. Some of the works he has created include Spider-Man, Black Panther, Captain America, Iron Man, Storm, the Avengers and other storied heroes from the Marvel Universe. The exhibit runs through September 8. Excelsior! March 9-September 8. Bess Bower Dunn Museum, 1899 W. Winchester Rd., Libertyville. Everyone’s a little bit Irish when it comes to March 17. A folk singalong and some green beverages are just the ticket (emerald green libations for adults of course). Here are the top St. Paddy’s Day events in Lake County. Erin go bragh! Has the Geico Gecko made you yearn to see a real reptile up close and personal? Lake Forest’s Recreation Center has what you’re looking for and then some as they host Wildlife Discovery Center’s Reptile Rampage. Take the family to see 150 unique reptiles including the center’s rattlesnake collection, lizards, snakes of all shapes and sizes, turtles, tortoises, crocodiles, an assortment of frogs and more. You will have a chance to receive all of the answers to your questions as some of the Midwest’s reptile aficionados from local zoos, universities, museums, nature centers and private collection experts in attendance. Besides the plethora of reptiles you must meet, there will be children’s arts and craft activities, face painting, a Scout patch challenge and an auction. Sunday, March 10; 10 a.m.-4 p.m. Admission: $10 donation. Lake Forest Recreation Center, 400 Hastings Rd., Lake Forest. Take the family out for a day of fun as DoubleTree Mundelein hosts the eighth annual Multi-Chamber Extreme Block Party Family Expo & Taste. This event will feature 100-plus local vendors, live entertainment, 50+ raffle prizes, a live reptile show featuring Dave DiNaso, face painting, food samples, product demonstrations from local eateries and so much more. This festive event is for all ages and free of admission. Saturday, March 23; 10 a.m.-3 p.m. Free admission. DoubleTree Mundelein, 510 E. Route 83, Mundelein. Continue here to learn more about Lake County Restaurant Week. Click here to learn more about the top things to do in March.